Soundscapes Exhibition, in the courtyard of the Tower of David, Old City of Jerusalem, Israel, wednesday 25/07/2007. Outdoor instruments play compositons as people walk around the grounds. there's a light show also which highlights the instruments playing. it's a beautiful space and the sounds are very melodic. 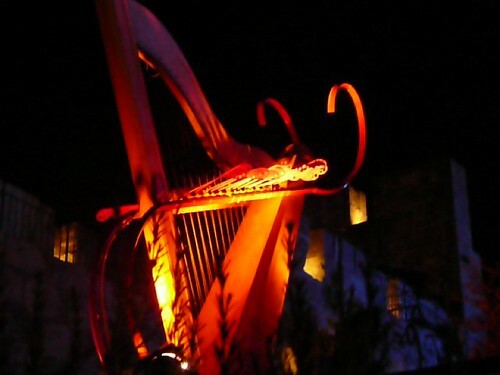 "Numerous oversized instruments, including a harp, drums, tambourines, bells and contrabass, are automatically played by computer command producing an original composition. Mechanical arms play the instruments and each creates its very own sound." "The instruments have been installed throughout the open-aired courtyard - in the water cistern, amongst the archaeological finds, under the arrow slits of the turrets and appear as an integral part of the citadel." "The notes produced by the instruments are played at different times, inviting the guest to tour among the instruments and enjoy the special sounds of this outdoor concert." 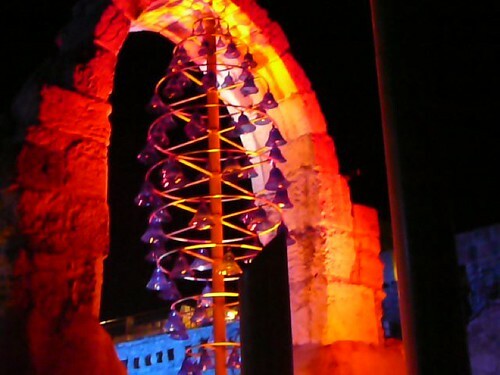 "The installation is presented together with spectacular lighting effects that mirror the sounds and brilliantly illuminate the ancient citadel at night."